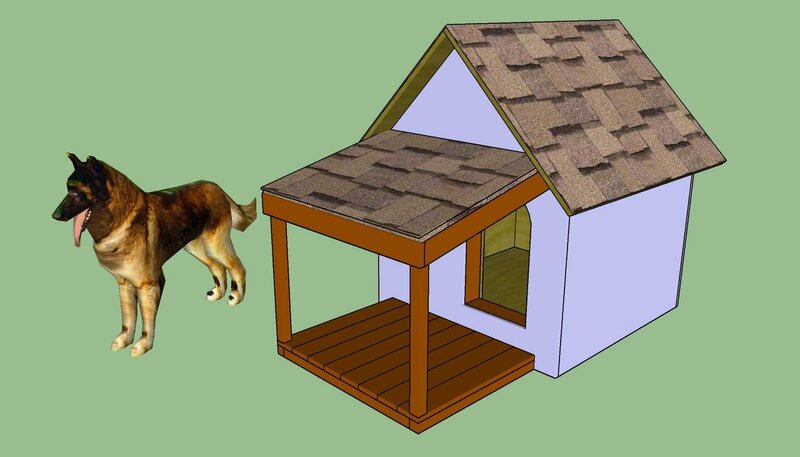 This step by step woodworking project is about rabbit hutch roof plans free. This is PART 2 of the project, where I show you how to build the lid and the front doors. This rabbit hutch is a nice addition to any backyard. My plans come with step by step instructions and you can easily adjust all the dimensions to suit your needs. See my other DIY projects HERE. First of all, attach the T1-11 siding panels to the sides of the hutch. Mark the cut lines to the panels and get the job done with a jigsaw. Smooth the edges with attention and use 1 1/2″ brad nails to secure the siding into place tight. Fit a piece of T1-11 siding to the back of the rabbit hutch as well. Align the sheets with attention and lock it into place with 1 1/2″ brad nails. 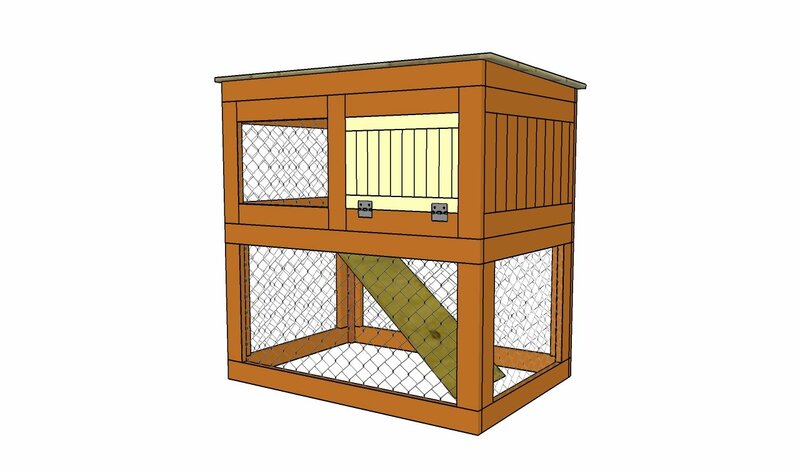 Build the partition for the rabbit hutch from 3/4″ plywood. Mark the cut lines on the diagram and then get the job done with a jigsaw. Drill pocket holes along the sides of the partition and secure it to the supports with 1 1/4″ screws. Build the ladder from 2×2 lumber. Cut the components at the right dimensions and lock the components together with 2 1/2″ screws. Drill pilot holes through the long supports and insert the screws into the steps. Fit the ladder to the rabbit hutch and secure it into place with screws. Build the doors from T1-11 siding and 2×2 trims. Lock the trims together with screws and then attach the T1-11 siding with 1 1/2″ brad nails. Add glue to the joints, as well. Fit the doors to the opening and secure them into place with hinges. In addition, install latches so you lock the doors into place tightly. Use 1×4 lumber for the frame of the lid. Drill pocket holes and then lock the components together with 1 1/4″ screws. Attach a piece of 3/4″ plywood to the top of the roof. Drill pilot holes and insert 1 1/4″ screws to lock the sheets to the frame. Use hinges to secure the lid to the back wall. Cover the roof with tar paper and then install the asphalt shingles. Fit drip edges to the roof of the rabbit hutch. As you can easily notice in the plans, you have a super easy access to the inside of the hutch. The lid can be easily opened and closed, so you can clean the floor in a professional manner. In addition, the two front doors are ideal for you to get the rabbits in and out the cage. Check out my other outdoor projects and plans. 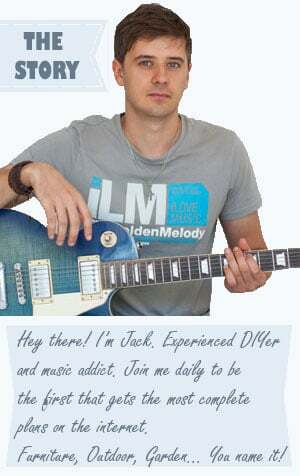 If you like my project, don’t forget to SHARE it on Facebook and Pinterest. In addition, I recommend you to take a look over PART 1 of the project, so you learn how to build the frame of the rabbit hutch. Thank you for reading our project about rabbit hutch roof plans and I recommend you to check out the rest of the projects. Don’t forget to LIKE and SHARE our projects with your friends, by using the social media widgets. SUBSCRIBE to be the first that gets our latest projects.